The sky has darkened after a sudden desert storm drenches the landscape. The Gulf of Oman kisses the shoreline with the comfort of long association – squeaky clean white deck chairs are lined up, sentinel-like, against the wall in my sight. As I am about to sink my fork into a lobster on my plate and a bowl of caviar awaits my attention at the city’s well-appointed Hotel Chedi, I conclude that Muscat is the place to be. After flying in the previous day on Indigo’s inaugural flight to Oman (welcomed as tradition goes with jets of water from fire engines parked alongside the plane on its debut landing), it is soon time to settle down for what is left of the night when we reach our hotel, Crowne Plaza. The next day, the business of breakfast dispensed with – my room offers a beautiful sloped view of the surroundings, as the property is situated atop a small hill – I am ready to leave for the Sultan’s Grand Mosque, a monument that no visitor to the region can miss seeing. Attired traditionally in my salwar kurta, the dupatta is swiftly wrapped around my head as soon as the sanctum sanctorum comes into sight. I walk leisurely across the courtyard towards the sparkling white edifice that is built from 300,000 tonnes of Indian sandstone. Walking into the main musalla – two royal guards stand watchfully at the entrance and caution visitors on where they can and cannot tread – I am enveloped by the sheer quiet of the interiors. Beyond the slim blue carpet on which we walk is sighted a huge carpet, which brings together the Tabriz, Kashan and Isfahan design traditions – it covers the entire floor of the prayer hall in a single piece. In between watching my steps so that I do not stray and taking in the intricate designs on the walls and enclaves, I glance upwards and get an unobstructed view of the huge chandelier that seems to drop down from the high ceiling. Later, my co-travellers for the day and I head towards the marina where we clamber onto a small yacht that takes us out deep into the sea for a bit of dolphin gazing. The clear water reflects the sky above as the boat picks speed. 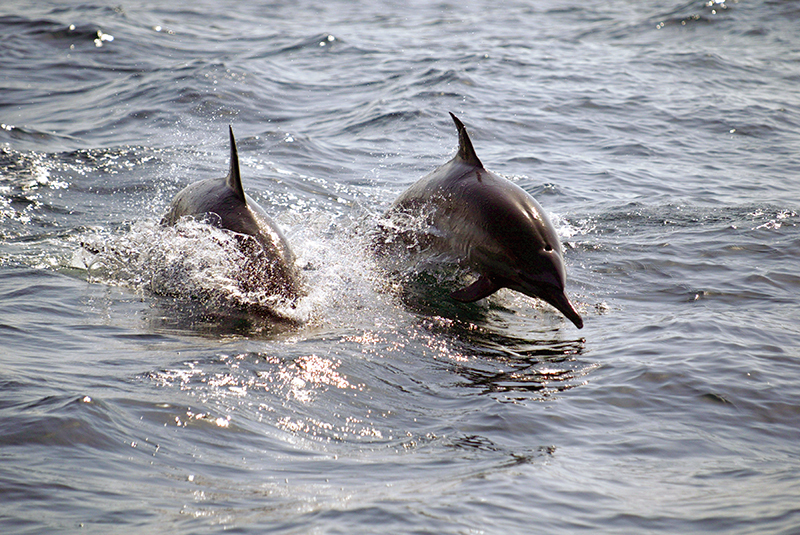 Ahead we can see a few rises and falls of surface, but alas, our anticipation is not satiated – for that day, the dolphins prove elusive. To give us some excitement in lieu of the sea creatures, the captain turns the ride into a carousel adventure and the boat crests and rides the surface of the water in a rollercoaster return. On terra firma, I cross the plank to walk aboard a private yacht that is chartered out for overnight stays – staff, fine dining and all. As I walk around, I notice it being prepped for a client who is willing to pay a premium price for a rendezvous under the stars on Omani waters. Two cabins are meant for the ‘guests’ while one small one can serve the lady-in-charge, Stefanie Trier, who keeps a watchful eye on the quality of service rendered – ensuring tables are well laid out, portions are properly plated and the wine is chilled to the perfect temperature. I join my friends and return to the hotel for a quick siesta – in the afternoon, the whole city sleeps as temperatures rise. Almost all the buildings are white (or in light pastel hues) – with due deference to the heat that burns the landscape, we are told by our guide, who is a Kashmiri who has studied his Masters in German literature and human rights. Unlike in Dubai, there are very few, if any, high- rises in this city. And when I ask him where one can buy the white spotless robe that men wear, he cautions that foreigners cannot wear it here, only locals can, although it is available in plenty across the stores. At night, we drive down to take a look at the Sultan’s Palace in the city. At the side, in the white buildings, we see expat children, gliding up and down the footpath on skateboards. Next day, we take a pit stop at a well-planned bustling market square en route to the famed Muttrah Souk. I watch a couple of young girls drive in, park swiftly and swish into swanky shops. The shopping area is clean, with well-maintained avenues. Easy camaraderie and swift repartee fills the air as the girls exchange ripostes with their friends on the pavement. At a café, the chairs are filled with youngsters exchanging notes, while office-goers seem to take a momentary break before going home. It is a far cry from what I had imagined. And Muscat today appears to be a great advance for Oman, an extraordinary country where the traditional and the contemporary blend seamlessly to form a unique society. There is a surfeit of huge malls that offer all the brands one can dream of, casual relaxation outlets like McDonalds, Starbucks and all the attendant paraphernalia of a swiftly developing city. Surprisingly, restaurants serving only Omani cuisine are rare. I spend a couple of hours in a shopaholic’s paradise, but walk out with just a purchase of seedless dates, leaving the rest of the buys for home. 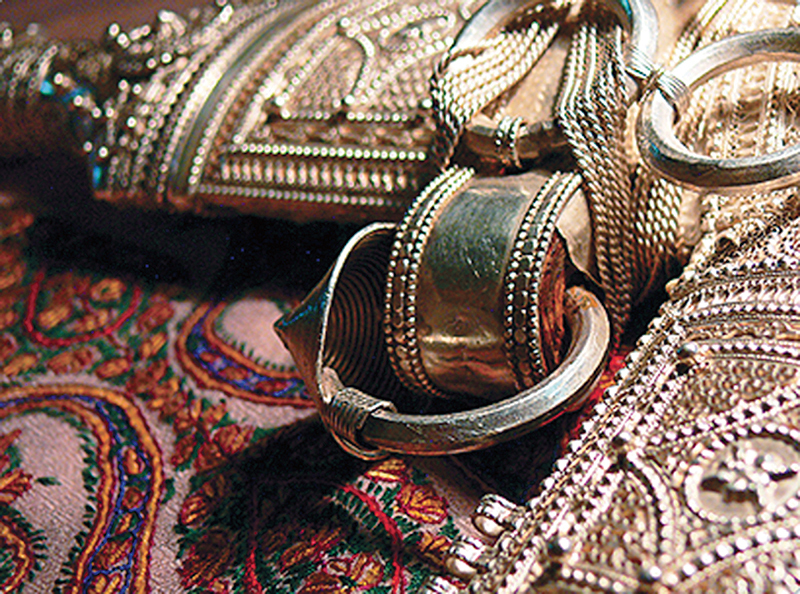 Despite globalisation, Muscat has, like Oman, retained one important tradition – its souks. 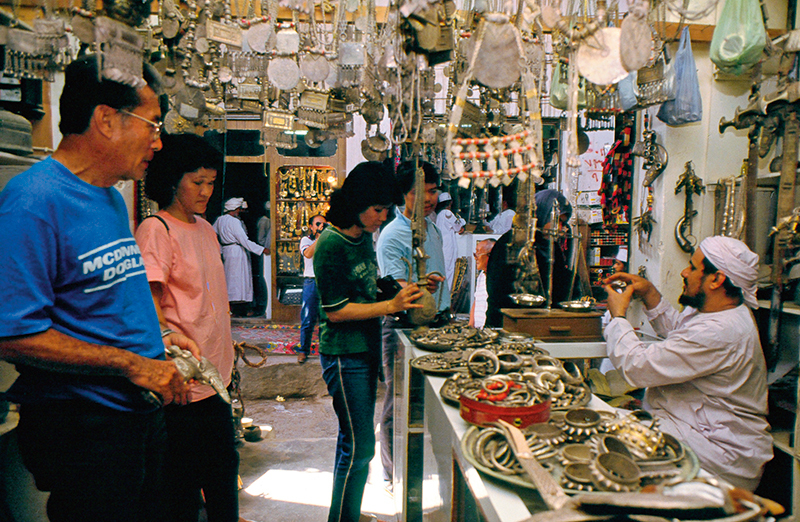 Souk shopping is a popular pastime and a great way of getting good buys, for locals and tourists alike. So, soon I find myself eagerly walking down Muttrah Souk. Even as we enter, the smell of frankincense and spices, the call of tea sellers, the tinkle of silver, and the sound of conversations in Arabic immediately draw me in. We freely browse the souvenir shops by the entrance, selling Omani handicrafts, silver jewellery and khanjars (curved daggers). In fact, the plethora of silver offerings is so tempting that I make mental notes to return to the market on my next visit here. My co-explorer and I tread carefully down the narrow, maze-like alleys, but it is not difficult to navigate the market. The temperature drops further as night falls and it is much more pleasant to explore the wares on show. Thankfully, no sellers push you to buy nor do the throngs crowd you into corners. At the end of it we have picked up four or five small containers of frankincense to show for our visit here. Soon, it is time to leave Muscat. And after the gourmet lobster and caviar meal at Hotel Chedi, I pass the just-opened Royal Opera House that shines bright into the night – the lights have come on in full force, as a theatrical extravaganza is all set to unfold. I promise to come back, like Oliver Twist asking for more, to experience the magic of an opera in the East! 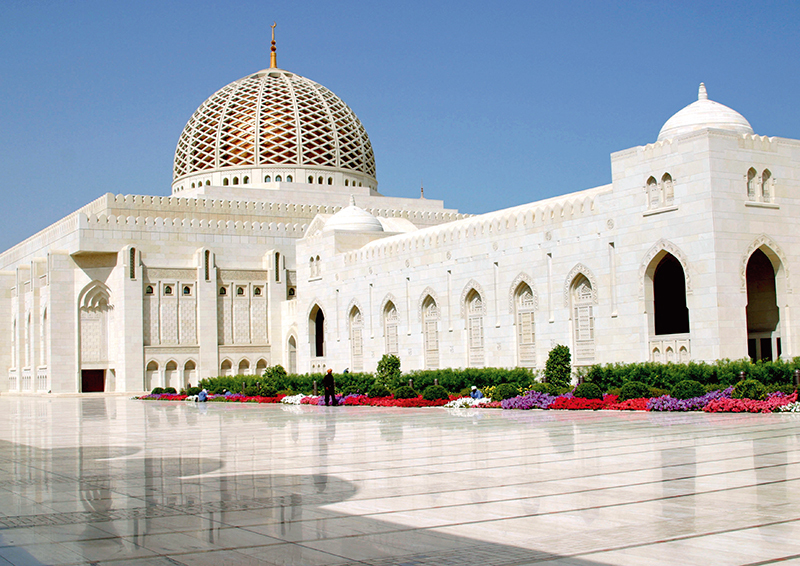 The Muscat Festival: Held in February, it celebrates Oman’s traditional arts, and culture. Walk the streets to experience the local flavour – an Omani stirring halwa in a large cooking pot is one of the routine scenes witnessed more often at this time. Al Bustan Beach: Muscat has ample beaches where you can sunbathe or swim or simply walk across the white sands to your heart’s delight. The Al Bustan Beach, in close proximity to the luxurious Al Bustan Palace Hotel, offers ample privacy. Qurum Natural Park: The largest park in the city, the Qurum Natural Park has been designed keeping in mind its original topography. In February, the garden will gain added interest due to the cultural events that will be held there during the Muscat Festival. The Bait Al-Zubair Museum: On Al-Saidiya Street in Old Muscat, this houses a vast collection of ancient household equipment, costumes and weapons. 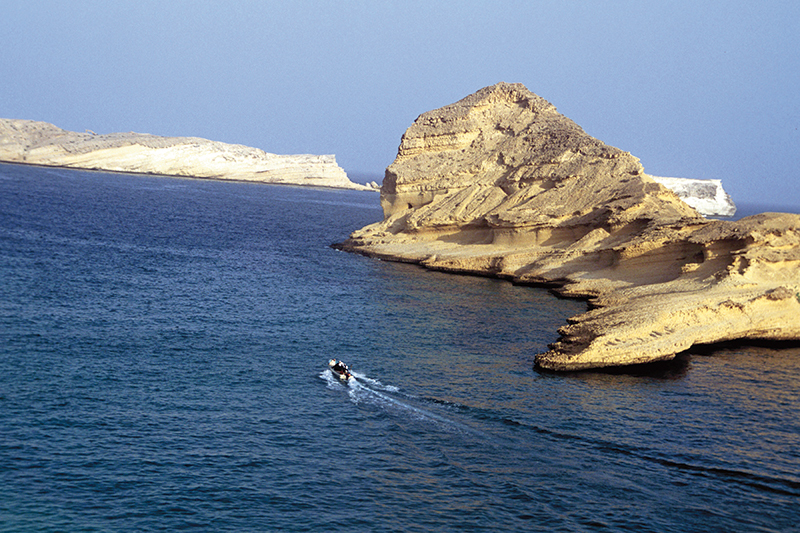 Visit this or the Bait Al-Baranda Museum on the seafront in Mutrah, which presents Muscat’s ancient life and geology.